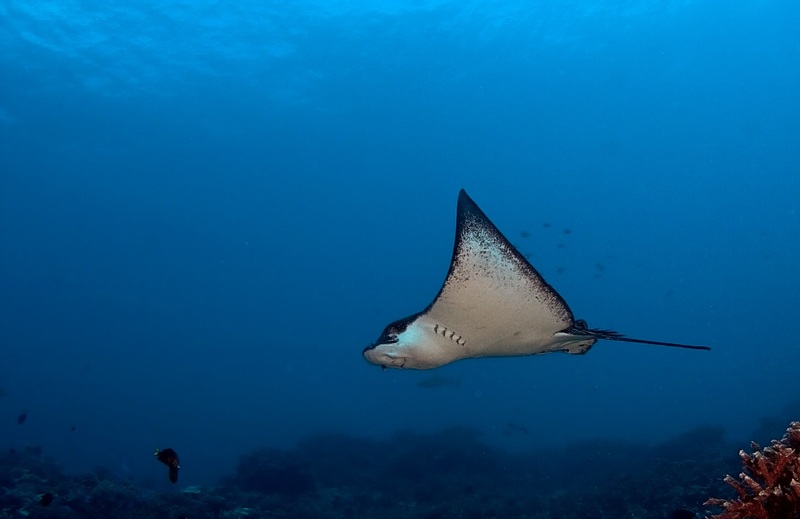 The spotted eagle ray (Aetobatus narinari) is a curious species immediately recognizable by its physical appearance. The spotted eagle ray is very distinctive from the others, by its flattened body and triangular corners to the wing-like pectoral fins. Its upper surface is blackish-blue with many white spots, and its underside is completely white. It measures around 6fts wingspan and 220Lbs. The record size known is about 10fts. Its head presents a strange narrow muzzle. This muzzle can be compared to a duck’s beak. The eagle ray has 7 rows of flat strong teeth to grind its food. Its long and fine tail presents up to 5 venomous spines whose painful sting can be fatal to humans. This species lives in the Red Sea, the Atlantic Ocean and the Indo-Pacific region. 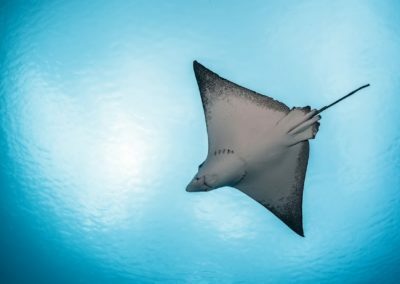 In French Polynesia, you can observe the eagle ray floating gracefully inside the lagoons,near the passes or on the oceanic slopes. 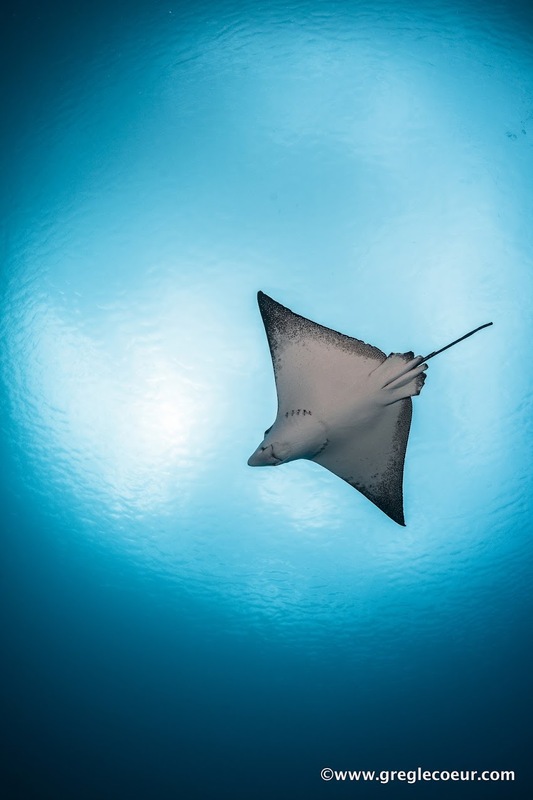 You can encounter this ray at dephts of up to 262fts. It usually “flies” alone but sometimes happens to find it in a school of a dozen animals. It feeds with crustaceans, small fish and mollusks thanks to a robust dentition. It uses its flat head and an electromagnetic sensitivity to detect any prey hidden in the sandy bottom. 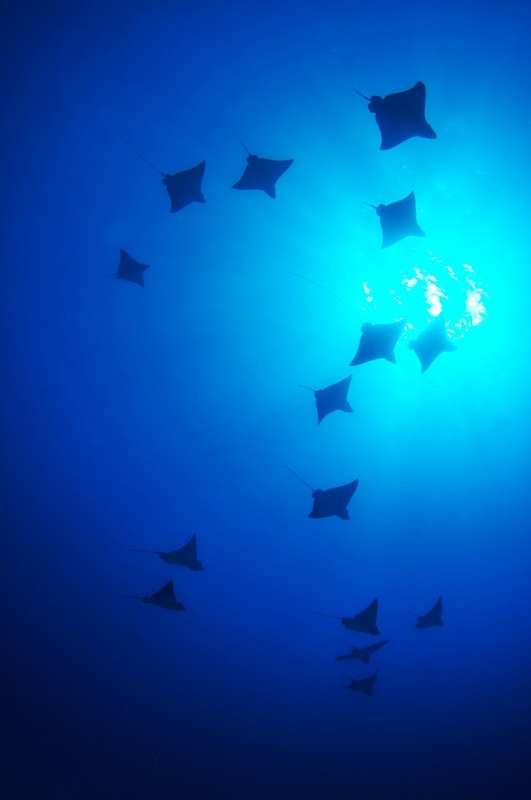 The spotted eagle ray is threatened by sharks. Unfortunately, it is the great hammerhead shark’s favorite prey – one of the best marine predators of our Polynesian waters. 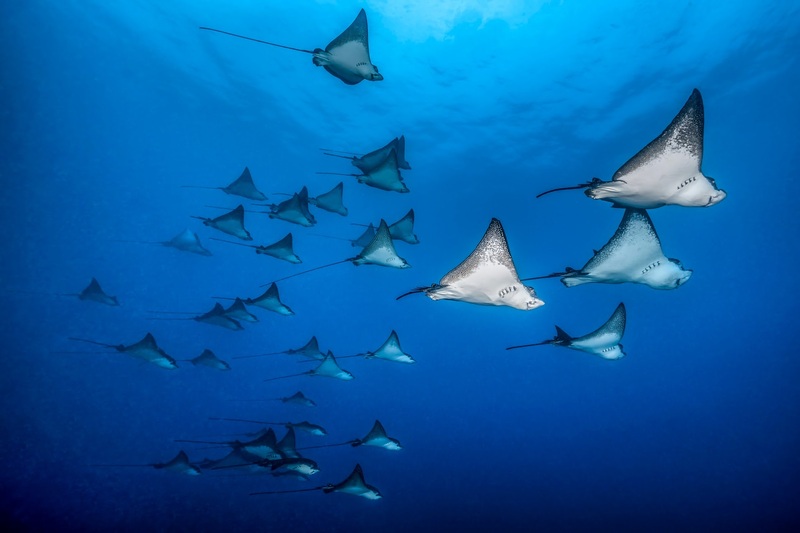 The spotted eagle ray seems to be slow but is able to do a fast acceleration to escape predators. It becomes sexually mature at 4 years. It gives life to around 10 little offspring after 12 months of gestation. 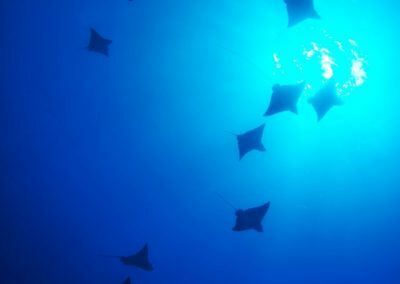 Due to seasonal reproduction, divers could attend to a gathering of hundreds eagle rays in Polynesian waters during the dry season (From April to October). 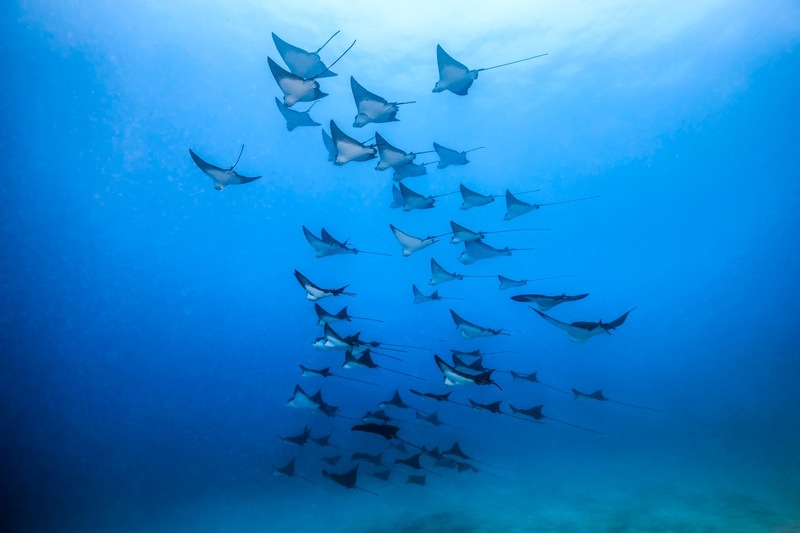 This impressive gathering is a must-see natural show in our tropical waters! !